This recently renovated and modern furnished apartment (BoConcept designer furniture) overlooks one of the most stunning views in the whole of Antibes. Sea, castles, mega-yachts, mountains - you can see it all! A sunny, lofty, top floor apartment with 1 bedroom and a pull out sofa in the lounge, it sleeps up to 4 people. All modern conveniences including kitchen, bathroom and appliances. The medium size terrace affords a view over old Antibes on the other side and how lovely to take your coffee in the morning sun! 1 Double Bedroom with King Size Bed. Cupboards for storage and doors opening onto the terrace. With view. Bathroom modernised walk in shower, toilet, and basin. Washer/dryer machine. Gaze out from the kitchen onto a magical view. Microwave, oven, dishwasher, fridge/freezer. Open Kitchen leads onto dining and living areas. Views on either side of living room. Comfortable and reasonably spacious living area. Isola, Auron, Valberg, etc - all approximately 1.5 hours drive from heart of Antibes. Next to Antibes Marina. Small beach 1 minutes walk. Plage Gravette 10 minutes walk. 30 metres to cafes and shops. 100 metres to Old Town of Antibes and many places of interest. 200 metres from the famous morning food market. Short walking to beaches Plage Gravette or Plage Salis. The Royal Beach Club is a great for a day, with loungers and a fantastic lunch on the sea. Marineland accessible by train or bus from Antibes center. Nice, Cannes & Monaco also accessible by train. Its location and views are wonderful. Excellent position - being so close to everything that Old Antibes has to offer is fantastic. An excellent choice of restaurants are on your doorstep. Whether you arrive by air or train it is so quick & easy to reach the apartment and start your holiday. Only an easy 5 minute walk to the apartment from Antibes Gare SNCF or Gare Routiere. If you want to venture out of town the excellent bus & train network is at your disposal. Gorgeous apartment in a great location. Just a short and easy 5 minute walk to beach and town. The apartment is clean and beautifully light and airy; the decor is modern and comfortable. We found everything we needed within the apartment, including two umbrellas (we had fabulous weather but it rained heavily on our first day). The view of The Port and mountains from the kitchen/dining area is gorgeous. Antibes is a lovely place to have a holiday, lots of lovely shops and restaurants and good beaches. As with most of The French Riviera you have to pay about 15€ per half day fora sun bed and umbrella, but there are beach mats and an beach umbrella 🌂� i in in the apartment . To get the fabulous views you do have to walk up four flights of stairs (80 steps) but we found it very manageable. We had a lovely holiday both with regards to the accommodation and area. Beautiful view on the harbor from the kitchen and breakfast windows. The apartment is in a nice location. We loved the view of the harbor from the kitchen and breakfast area windows. The apartment had everything that we needed, including laundry soap for washing clothes. The bed was very comfortable and the bedding was very nice. It would have been nice to have a second set of keys. We stayed for 2 weeks and were not always on the same schedule. Lots of stairs but good location and great views. Anne met us as we arrived and was very helpful. Really enjoyed sun on south balcony and views towards the harbor. Short walk to beaches, markets and town center. Comfortable and well equipped apartment, ideally located in Antibes for the beaches, shops and public transport links. Excellent air con. 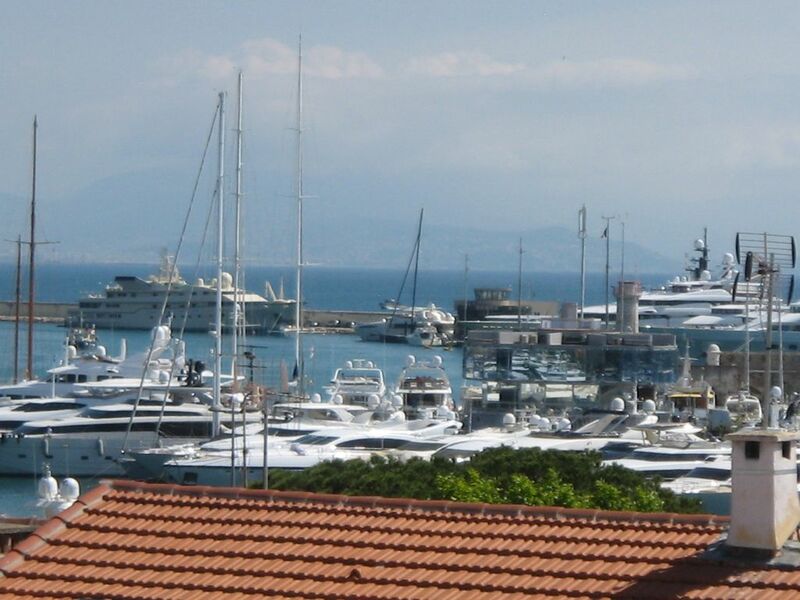 We will miss the fantastic view of the marina, forte and distant alps. Great apartment in an ideal location close to the old town and the marina.